Harrison Pippin ’18 talks to a patron of the Lynchburg Community Market. 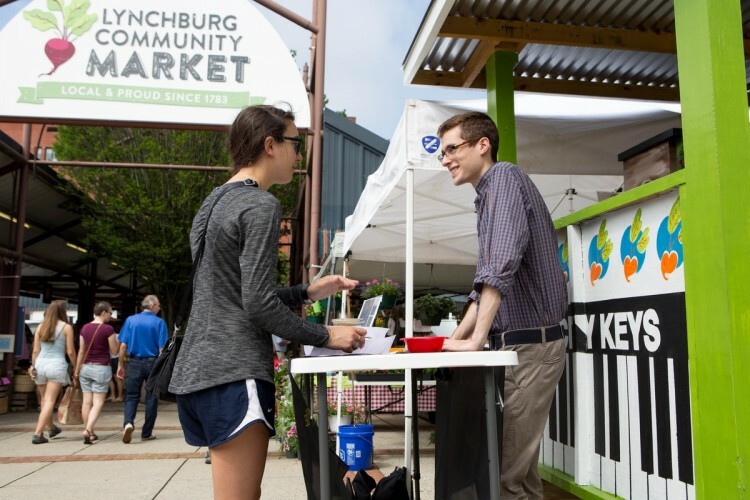 Each weekend this summer, Harrison Pippin ’18 has traveled downtown and set up a table at the Lynchburg Community Market. He’s not there to sell fresh produce, however—he’s there for research. As part of a Summer Research project with sociology professor Brad Bullock, Pippin has been administering a survey each week at the market, based on the New Ecological Paradigm (NEP) scale. First published in 1978, the NEP is used to measure the public’s world views as they relate to the environment. It was updated in 2002 to include more questions about climate change and mass pollution. Sociology professor Brad Bullock and Harrison Pippin ’18 talk about their project. In his survey, Pippin asks citizens to list their birth year, preferred source for environmental news (i.e. Internet, TV, newspaper), and how much time they spend reading about environmental issues. His hypothesis for the research is that more frequent Internet users are more aware of environmental issues and more likely to get involved in environmental causes. Pippin believes the project is an opportunity to measure differences in Internet usage between generations as well. He and Bullock decided to administer the survey at the community market in order to obtain data from local citizens of all ages. A sociology and environmental studies major, Pippin is fascinated by the increasing popularity of the Internet and its ability to sway popular opinion—especially among millennials. Pippin will write a paper about his findings and submit it for peer review as part of Summer Research. He also plans to present his project during the upcoming academic year at Randolph’s Symposium of Artists and Scholars and the Mid-Atlantic Regional Conference for Undergraduate Scholarship (MARCUS). After Randolph, Pippin will pursue a career in community development.